I found an article that really interested me, after Yesiris tweeted about it. Someone who may have not been born in the “age of technology” may be quick to say that it is doing nothing but bad for our social skills, but when a closer look is taken, that may soon be rethought. Colin is a ten year old boy who has disabilities which affect his social skills as well as causing him to act out in school. Unfortunately, this has caused some of the children in his class to dislike him and see him differently. When Colin’s mother asked him if he’d like to have a birthday party, he said no because he didn’t have any friends so there wouldn’t be a point. His mother took this problem of her son being treated differently by the children at school into her own hands. She decided to make a Facebook page to help get birthday wishes and words of encouragement for her son. The response was incredible. 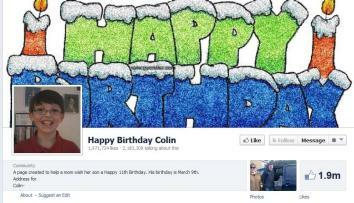 People from all over the world were writing and sending birthday cards to Colin to make him feel loved on his birthday. Although it may be seen as belittling him, Colin’s mother did her matriarchal duty through social media to make her son feel loved on his birthday.